Atalanta was a great Arcadian huntress and a favourite of Artemis, Goddess of the hunt. Disappointed because he wanted a son, she was exposed by her father in the wilderness at birth, but was suckled by a she-bear and afterwards found and raised by hunters. She swore to Artemis to defend her virginity and, when two Kentauroi (Centaurs) burst into her grove, and tried to ravish her, she destroyed them with her arrows. Later she participated in the voyage of the Argonauts, and defeated the hero Peleus in wrestling at the funeral games of King Pelias. When Meleagros gathered heroes to destroy the Kalydonian Boar, Atalanta joined the hunt and was the first to draw blood. Meleagros awarded her the prize of the skin, and when his uncles tried to take it from her force, he slew them. Atalanta was later reunited with her father Skhoineus (or Iasios), who insisted that she be wed. She agreed, but on condition that the winning suitor must defeat her in a race, and that all who tried and lost should be put to death. 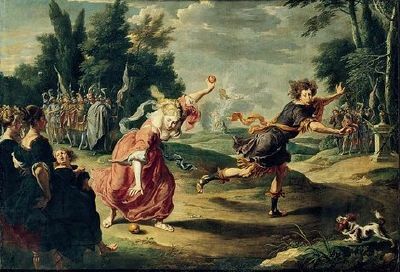 Hippomenes, however, sought the help of the goddess Aphrodite who presented him with three golden apples to cast before the girl in the race. When Atalanta stooped to retrieve these, she was slowed enough to allow the hero to emerge victorious. Atalanta and Hippomenes were both delighted that he won the race, and in their mooning over one another, he forgot to honor Aphrodite, failing to properly show his gratitude. As the couple walked through the deep woods, they passed a holy shrine to Mother Earth, or Cybele. Aphrodite caused Hippomenes to go mad with lust and passion, and the young couple made love inside the shrine, desecrating it. 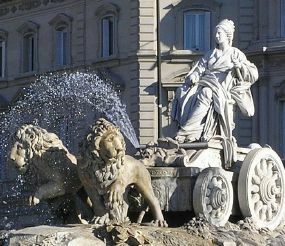 In punishment, Cybele turned them both into lions and bridled them like horses. Atalanta and Hippomenes Tile Swap Puzzle as well as many other lovely and fun puzzles of Lovers. the Atalanta and Hippomenes Jigsaw Puzzle in our Amusements section.